← Close Your Eyes And Follow Me – Review: Neela Vermeire Créations Trayee, Mohur, Bombay Bling! 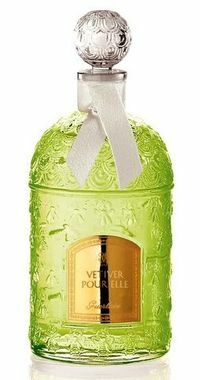 I received a sample of Vétiver pour Elle quite some time ago and, typically for me, ignored it, because I am – to a large degree – influenced by name. To my vindication I have to say, there must be something I go with, because my sample box is so full, I cannot possibly smell everything I get, immediately. And if a perfume has the bad luck to be called a name I don’t care for, well, it gets pushed back. Guerlain or not. Notes include bergamot, orange blossom, honeysuckle, muguet, nutmeg, vetiver, and tonka bean. Vétiver Pour Elle was created by Jean-Paul Guerlain in 2004. Vétiver pour Elle opens fresh and green, a bit soapy at times, at develops into a heart of dominant lily of the valley and subdued orange blossom, with a twist of nutmeg. The vetiver is very prominent to my nose, although I have read (and puzzled over) reviews that do not find the vetiver to be present at all in there. To me Vetiver pour Elle is what it says on the bottle – a vetiver presented in a cute floral dress and a little lipgloss. It never completely loses the clean-soapy feel. Since I am no great vetiver lover (although there are exceptions), I rather like the “feminized” version presented here, but I suspect true vetiver lovers will find this a bit too cushioned and decorated, too lovely and cute. Vètiver pour Elle is a perfume for vetiver-shy people with a lot of money on their hands. As a next step on the vetiver ladder, I’d try Hermessence Vétiver Tonka. This entry was posted in Fragrance Reviews, Guerlain, Vetiver and tagged Fragrance, Guerlain, Perfume, Review, Vetiver, Vetiver Pour Elle. Bookmark the permalink. Hi Birgit, Monsieur Guerlain, Ulrik T, says it’s not DC, only Iris Ganache is to be DC for now. Thanks for the lovely review:-) Hope you are well again. Interesting! Well, to be honest I would have preferred it the other way around… Thank your for the info, Asali! Such a pity it is discontinued! I don’t understand… I still think despite the hard times, people still end up buying perfumes! (I meant that apparently the Retailers aren’t telling us the truth very often – while supposedly, the Main House are!-). I am sick and tired of the major perfumery departments and regular stores where it’s often told that a perfume is being DISCONTINUED because they won’t have it anymore…!!! I’m sorry but F**’em All! That is horrible being lied to by a retailer. But maybe they are often just not very knowledgeable or too lazy to find out what is really up with a perfume… sad sigh. Right, I agree, but that’s the problem. I’ve learned being skeptical towards the ‘ignorance’, and sadly now I’m always thinking the worst = because one thing follows another. So before admitting they’re not knowledgeable or too lazy or telling us about selling policy of some shops owners (they don’t want a brand in particular anymore, or they don’t come to an agreement with the brand or they don’t make too much profit with a perfume, or even if TEMPORARILY they don’t have the perfume you want), they prefer to say ‘Sorry, may it be discontinued? ?’ / ‘I haven’t heard of this perfume [anymore/ since a long time ago/ etc] so I’m pretty sure it’s being discontinued’/ [et al… ]. If they’d just shut up… Even when it’s hard to believe that a certain perfume is not selling well, or when you are pretty sure that it’s a must and it’s impossible that they discontinued it! If they’d just shut up, or if they just said ‘We won’t be getting it anymore’ … but instead, they prefer to induce people to confusion! that to me it’s like comitting a swindle by leading us under a misunderstanding -and possibly also intending to try to make us buy another thing-. This does not take away the mainstream perfume houses predatory procedures to create the ‘fast food’ contemporary ‘FASHION item’ releases which hardly last more than 3 years… that is an excuse to sacrifice the beauties of the past, often presented as New, but ‘remade’ and desvirtued. I don’t know how I still can love Perfume after all…. This world stinks. Apparently it isn’t after all – we’ll see. But I totally agree with your sentiment, all that juggling around with limitations and discontinuations is exhausting and frustrating. andrea, next time let me know. I could have got it from Harrods for you! I haven’t really explored vetiver as a note, but on the coldest of days I do enjoy a roaring fire, a good book and Lalique’s Encre Noir. Guerlain’s discontinuation policies are very strange. I do hope Iris Ganache lasts until June! I’m saving my pennies for a trip to Paris! As for Vetiver Pour Elle, I agree with your review completely, it’s a lovely summery floral vetiver. What I could never understand is that it was a relatively cheap travel fragrance that is now sold for a phenomenal price (in comparison) as part of the Les Parisiennes line. I hope you’ll still get your Iris Ganache in June! Despite not being a vetiver fan I always fancied this one. Probably because it is feminine, dressed up version of vetiver. I was sick when I was at the Paris airport a couple of years back but didn’t have time to go to duty free. I feel better now after reading your review because it doesn’t sound like you fell madly in love with it. That’s good enough for me. Like everyone else I can’t get over Iris Genache being discontinued. Très odd. No, madly in love I’m not. It is nice, but I won’t get grey hair should it turn out to be discontinued after all. You would be perfect in such a dress, I can just picture you! 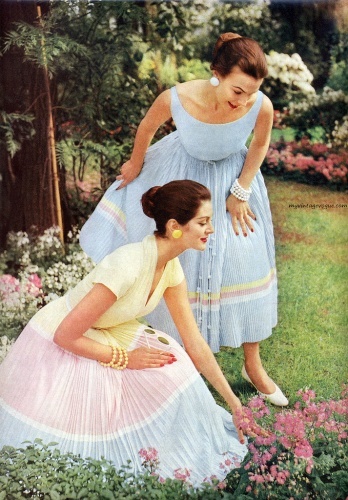 I want that blue dress. I won’t, I promise! 😉 That sound slike a great idea though, Bee. Layering the Guerlain and the Malle must be a beautiful combination. Too bad they’re discontinuing this! I had wondered if it might appeal to me, not being a huge vetiver fan. There have been differing reports so far, another blogger reported that only Iris Ganache is discontinued, but not Vetiver Pour Elle (see the comments above). So until there is more clarification from Guerlain, I’m not sure what is true. I love the vetiver note and have tried many vetivers. this is one of the few that I haven’t tried and want to. The original Vetiver is one of my all-time favourites. I heard it is not discontinued after all, so your chances of trying it are intact. I’d like to add here that I always thought it would be hard to sell Vetiver Pour Elle in the Parisienne line- more sporty women would rather be attracted if it was sold as counterpart to classic Vetiver and they would more easily discover it at the counter too. You must be quite into perfume to even approach the elegant Parisienne bottles…Huge loss!! !